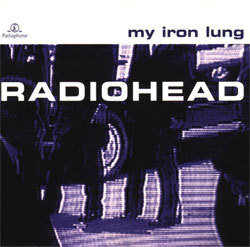 My Iron Lung is a 1994 EP, including the song of the same name, by the alternative rock band Radiohead. The title track more famously appeared later on the band's 1995 album, The Bends. The EP also contains outtakes from then-ongoing recording sessions for The Bends, compiling songs that were issued as B-sides on two separate "My Iron Lung" CD singles in the UK and other markets. My Iron Lung was originally released in EP form with all eight songs only in Australia, but it is currently in print worldwide. The record is seen as a bridge between the relative simplicity of their first album, 1993's Pablo Honey, and the greater sonic depth the band sought in their later '90s work, beginning with The Bends. The "My Iron Lung" single charted at #24 in the UK, a decline from "Creep"'s peak of #7. It also received little radio or MTV attention in the United States, especially as compared with "Creep".